With our more than 75 years of experience, Midwest Precision Manufacturing is a respected provider of deep hole boring services to clients in the oil & gas industry. We have pioneered proprietary techniques that allow us to create large, accurate, and deep holes in the hardened steel components widely used by this market. One example is the fracking block highlighted here. The 4150 steel casting featured dimensions of 53” in length x 23” in width x 20” in height. Our responsibility was to create five 3” diameter thru holes in this hard, tough material. 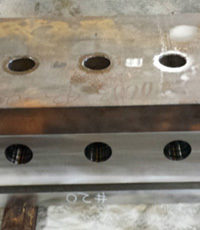 We developed specialized tooling and maintained tight control of drilling speeds to minimize drift and maintain straightness on these long cross holes. The deep bores featured a 125 Ra surface, and we upheld tolerances of ± 0.030”. Both dimensional and visual inspections confirmed we met the requirements of the customer specifications. We completed the 15 unit order in a one week timeframe. Not many shops can create such accurate cross holes in high strength castings, which is why this customer counts on us for this type of precision work for their extreme duty components. If you are interested in learning more about this project or our deep hole boring capabilities, contact us today. Drilling multiple diameter holes in multiple locations and sides of the block. (5) Ø 3" Diameter Holes Thru.